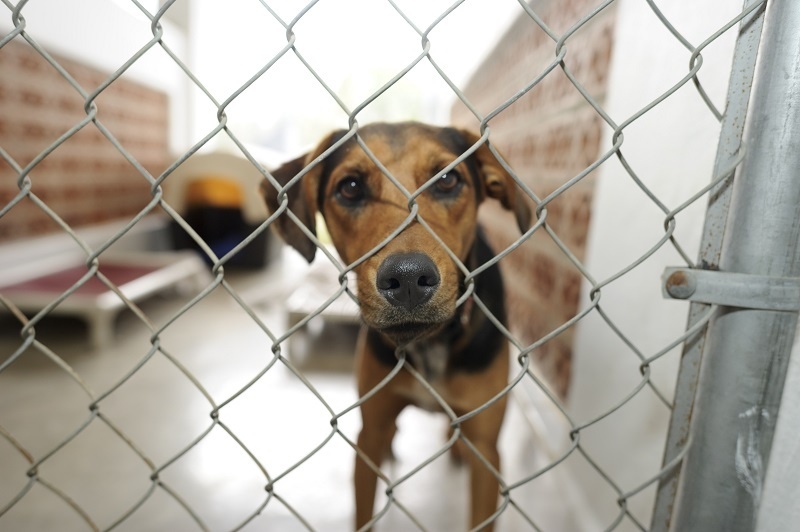 Kennel stress is a very common problem that rescue workers encounter in dogs in their care. Rescue kennels are stressful environments for most dogs and that stress can have a major impact on their welfare and management – and ultimately their chances of being adopted. However, not all dogs coming into a shelter suffer from acute or chronic stress. This may be because they may already have experienced a kennel environment, possibly within a boarding kennels, and therefore initially are able to tolerate a change in routine; although a lengthy stay may result in the development of chronic stress. Conversely, for some dogs, the arrival into a shelter and the loss of familiarity, routine, social contact or attachment figures can be perceived as a ‘threat’ to their safety and survival and induce acute and very severe stress. A combination of genetic and environmental factors can affect an animal’s ability to cope with novel situations and learning tasks. The secretion of hormones, such as the corticosteroids, through dysregulation of the hypothalamic pituitary adrenal axis, in response to prolonged stress, can reduce brain levels of serotonin, explaining the many abnormal behaviour patterns sometimes seen in dogs in rescue shelters. The opportunity to perform previously innately reinforcing behaviour patterns may be restricted or totally unavailable to dogs in shelters. Inability to express or engage in innate motor patterns may result in a lowered mood state, provoking intense emotional responses to various stimuli. Irrelevant behaviour patterns, displacement activities or coping strategies such as scratching or barking, may be exhibited in response to the frustration of intermittent reinforcement. Inadequate or ineffective reinforcement may elicit adjunctive behaviours such as drinking or redirected aggression, or a hyperactivity state caused by the arousal of the noradrenergic pathways. Low levels of serotonin have been associated with high locomotor responses especially in response to novel situations such as a change in surroundings like a rescue shelter. Therefore, a stabilisation of the key neurotransmitters will raise mood state, reduce intense emotional reactions and help dogs to learn adaptive behaviours within the rescue. Serotonin in the brain is synthesised from tryptophan, an essential amino acid. Mammals are unable to synthesise tryptophan and, therefore, levels in the brain depend on the presence of adequate dietary concentrations. The level of tryptophan and other large neutral amino acids provided in the diet can influence the brain concentrations of these amino acids and subsequently alter behaviour. Val Strong’s MSc original serotonin enhancing diet uses insulin, secreted in response to carbohydrate ingestion, to regulate plasma glucose levels and divert other large neutral amino acids to peripheral skeletal tissues where they are involved in energetic and immune system pathways; thus, enabling tryptophan to gain a competitive edge across the blood brain barrier and increasing levels of serotonin in the brain. Breakthrough has been developed to replicate this serotonin enhancing diet. The use of Breakthrough at several rescue centres, including Wood Green Animal Shelter has proved to be useful in helping reduce kennel stress and associated adjunct behaviours, enabling a stabilisation of behaviour patterns and the subsequent, successful rehoming of a significant number of dogs.